Till death do us part. . . . ! All Praise belongs to Allaah and Praise and Peace be upon the one who was sent as a mercy for all the worlds and upon his Family and his Companions. This hadeeth is one of the rarest authentic Prophetic hadeeth regarding strong exhortation to be good to women, being gentle with them, being patient with them, having a concern for them, encouragement not to divorce them, and to remain with them until death even if you have been her companion for a long time. Even if she has produced all the offspring that is possible for her, you should not divorce her unless you are certain (that it is the best thing to do), or it is impossible to live with her. Now we will look at this rare hadeeth and some of its benefits. This hadeeth is a clear refutation against those who do not treat their women in a good way. It is a reminder to everyone who is deceived by the so-called rights of women in the west! 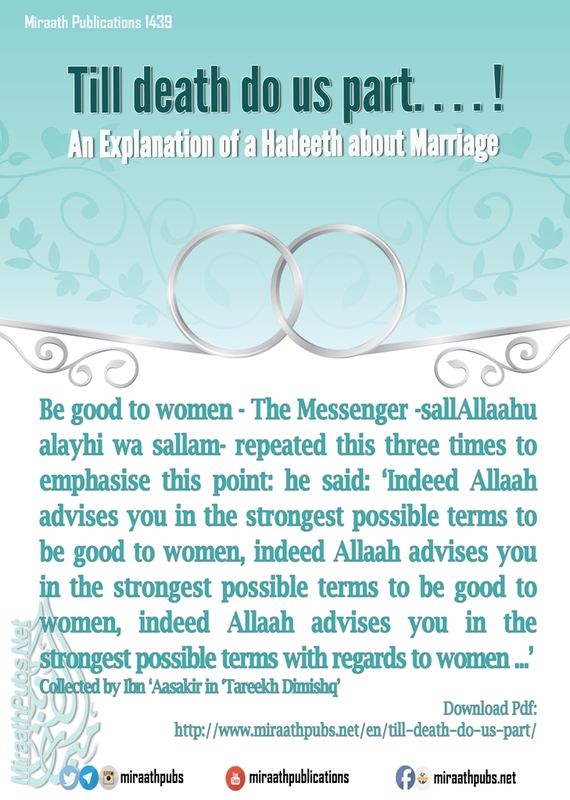 2- Then the Prophet -sallAllaahu alayhi wa sallam- explained that this advice is not specific for a certain type of woman. He explained her relationship with the Muslim male, thus she is a mother, and what will make you aware of what a mother is? The advice which is given concerning being good to the mother, is what you already know and is not hidden from you. ‘Chapter: Who of the people are most deserving of good companionship? From Abu Zur’ah From Abu Hurairah –RadhiAllaahu anhu– who said: A man came to the Messenger of Allaah -sallAllaahu alayhi wa sallam- and said: ‘O Messenger of Allaah who from the people is the most deserving of my good companionship? In this narration there is an extra benefit which is the wording: ‘the next closest relative then those closest after them.’ Which can be used as an evidence for having good companionship with the wife, the daughter the sister and the aunt, and no one can doubt how closely related they are to you O Muslim slave of Allaah. As for the saying: ‘The most deserving of my good companionship?’ Which means who are the foremost people with whom I should fulfil favours for, be good to and honour. Good companionship is connected to being gentle and kind, having good speech, having good dealings, implementing good manners all of which Islaam brought forth and has encouraged. So Allaah equated the mother and the father in what is bequeathed, however, Allaah singled out the mother with these three things, pregnancy, giving birth and suckling the child. This is the advice of Allaah for being good to daughters, so that they are not neglected, as they were in Jahileeyah. So much so that at that time they used to bury their daughters alive. Likewise, it was not as the enemies of Islaam behave today (with their daughters), by only looking after them when they are young, but when they reach maturity they leave them to the streets to deal with themselves, astray, struggling in depravity and committing vile and shameful deeds in the most disgusting manner and offensive form, the like of which the history of mankind has not known. She is a sister, a paternal aunt (father’s sister) and a maternal aunt (mother’s sister), and they have all been mentioned with the advice of being good to them. As for the paternal aunt and the maternal aunt then Islaam has encouraged Muslims greatly to have good relations with them and to be good to those who are the closest of relatives and then the next and then the next. No one can doubt that the paternal aunt and maternal aunt are connected to a Muslim from the direction of his mother and his father, therefore the paternal aunt and maternal aunt are of the same status as the mother and the father. Due to this, it becomes obligatory to have good relations with them and to be good to them and to honour them. ‘The maternal aunt is of the status of the mother.’ Collected by Bukhari, Ahmad and Abu Dawood. 3 – The Prophet -sallAllaahu alayhi wa sallam- encouraged his Ummah with the advice of being good to women, to honour them, to look after them, and to be patient with them in a general sense and especially with the wife. Just as you would like your daughter, or your sister, or your paternal aunt and your maternal aunt to be honoured, and it would make you happy. In the same way you should honour someone else’s daughter (who is your wife) she is like a captive given to you and she has given the flower of her life to you. 4 – The Prophet -sallAllaahu alayhi wa sallam- mentioned in the above mentioned hadeeth that the people of the two books (Jews and Christians) would honour their wives, and a man would remain with his wife all his life, loving her and being good to her, this is despite the fact that they are the people of sin, disbelief and Shirk. Therefore, O Ummah of Muhammad you are the people of Deen, Taqwa and Istiqamah therefore you should be the foremost in adopting these great manners. This is the wording Bukhari mentioned in ‘al-Adab al-Mufrad’ & in his ‘Saheeh’. Collected by Bukhari in ‘al-Adab al-Mufrad’, Ibn Majah, al-Hakim, Ahmad & Ibn Hibban. Albaani said it was good. Silsilah Saheehah no. 2776.